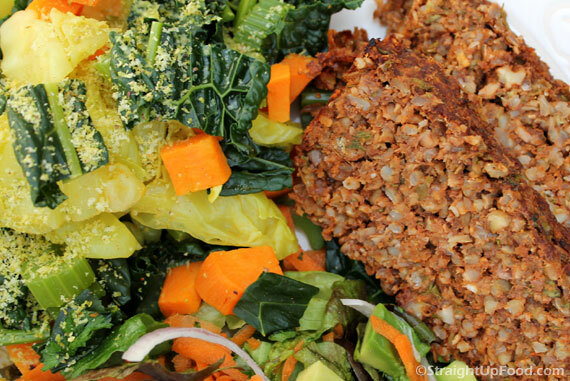 This flavorful loaf is perfect for the holidays, or anytime you want a hearty main dish. It can be made with fresh or dried herbs. Make two loaves while you’re at it and freeze one for leftovers. This is delicious topped with Creamy Mushroom Gravy! 2. Preheat oven to 350 degrees. Line a standard size loaf pan (9 by 5 by 3-inch) with parchment paper (see photo below) and set aside (or use a silicone loaf pan). 3. In a medium skillet on high heat, add 1 tablespoon of water. When the water begins to sputter, add the chopped onion, mushrooms, and celery, and cook stirring for about 3 minutes, adding water just as needed to prevent sticking. Add the garlic, and cook stirring for an additional 2 minutes, until the vegetables have softened (adding water as needed). If you’re using dried herbs, stir them in with the garlic (if using fresh herbs, add them in next step). Remove from heat. 4. In a large bowl combine the oats, tomato paste, nuts, and if you’re using fresh herbs (rosemary, thyme, sage) add them now as well. When the cooked vegetables, and rice and lentils have cooled for about 10 minutes, add them to the bowl and stir until all ingredients are mixed thoroughly. 5. Place half of this mixture into a food processor. Pulse about 3 times, then scrape down sides; pulse another 3 times, so it gets blended but is still somewhat chunky. Spoon this into the loaf pan. Place the remaining mixture into the food processor and repeat pulsing in the same way. 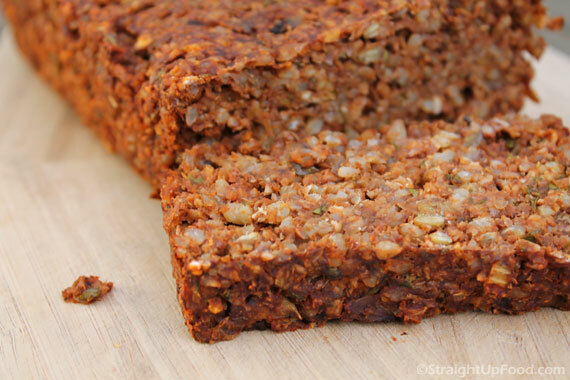 Add this second half to the loaf pan. Press down firmly and into the corners. Shape the top flat or with a slight rise down the middle. 6. Cover with a piece of aluminum foil and cook for 40 minutes. Remove the foil and cook for another 15 to 20 minutes until the top is browned and the edges are crispy looking. Remove and let cool 10 to 15 minutes before slicing and serving. Serve as is or with Mushroom Gravy or homemade ketchup. Herbs: During the holidays I like to use fresh herbs in this recipe, especially fresh sage, as its aroma and flavor are very “holiday.” But fresh herbs aren’t always practical, so feel free to use the measurements for dried. Or even a mix of fresh and dried. Rolled oats: I like quick oats in this recipe, but if you only have “slow” oats, just pulse them a bit first in the food processor. Blending: I’ve also made this loaf without using the food processor at all (just mixing everything in a bowl) and it still bakes up well and tastes great, it’s just more on the chunky texture side. Above: Cook until the top and sides are browned, as shown. The longer the cooked loaf cools, the firmer it will be and easier to slice. 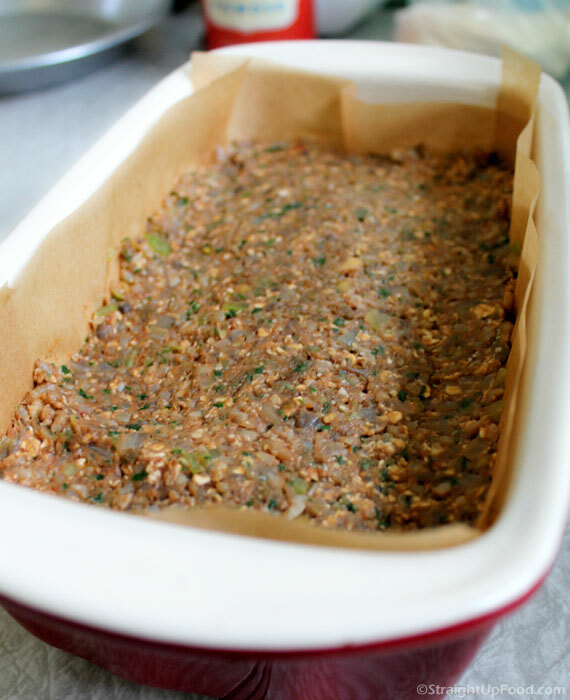 Above: The loaf pan is lined with parchment paper (see this post for instructions on how to line a pan with parchment). I used a ceramic pan, but you can also use metal, glass or silicone. Press the uncooked loaf “dough” into the pan firmly before baking. 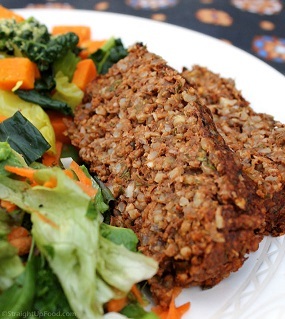 Above: Lentil & Rice Loaf Served with steamed cabbage, celery, kale and yam, with red onion and grated pistachios on top. Click here to visit my Amazon kitchen store with all my favorite products (appliances, pans, kitchen tools, food items, and books). When you make a purchase, I receive a small commission that helps support this site. Thank you for your purchase and your support!